Endroit idéal pour passer des vacances de repos et tranquillité . Location de voiture à 30 m . Promenade le long de la mer de 2 km . Supermarché, bars, restaurants etc à 500 m . Sortie de l'autoroute à 2 km . A 6 km du Golf Abama . Playa de Las Americas à 15 min en voiture . Grande terrasse ensoleillée avec vue mer . Ideal place to spend holidays of rest and tranquility. Car rental at 30 m. Walk along the sea 2 km. Supermarket, bars, restaurants etc 500 m. Highway exit 2 km. 6 km from Golf Abama. Playa de Las Americas 15 minutes by car. Large sunny terrace with sea view. Idealer Ort für einen Urlaub der Ruhe und Erholung. Autovermietung in 30 m. Laufen Sie 2 km am Meer entlang. Supermarkt, Bars, Restaurants usw. 500 m. Autobahnausfahrt 2 km. 6 km von Golf Abama. Playa de Las Americas 15 Minuten mit dem Auto. Große sonnige Terrasse mit Meerblick. Lugar ideal para pasar unas vacaciones de descanso y tranquilidad. Alquiler de coches a 30 m. Caminata a lo largo del mar 2 km. Supermercado, bares, restaurantes, etc. 500 m. Salida de la autopista 2 km. 6 km de Golf Abama. Playa de Las Americas a 15 minutos en coche. Gran terraza soleada con vistas al mar. A lovely apartment in an ideal position for a great holiday. 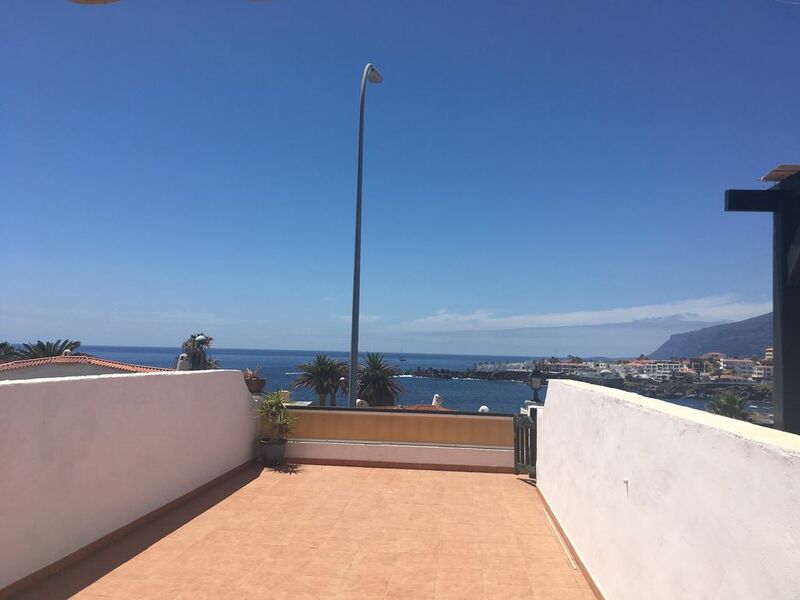 I enjoyed a lovely two weeks holiday in this one bedroom apartment with it's large patio ideal for sunbathing, with beautiful views of the sea, La Gomera and towards Los Gigantes. Entry from the road to the access steps was via a security door and as a solo travel I felt extremely comfortable and secure at all times. Luc, the owner, met me on arrival and made me very welcome. The apartment was very well equipped for self catering and plenty of towels and bedding were provided. There is an attractive communal pool area at the rear of the apartments. There were numerous restaurants in easy walking distance, a very nice one Restaurante Martini within 5 minutes. There are supermarkets and fresh produce shops nearby and again all within an easy walk. A car was not essential as there was a regular bus service. The apartment is situated on a quiet road leading to a lovely picturesque coastal path that follows the coast line to Punta de Alcala, which has a local Monday market. There were several cafes to stop and enjoy a relaxing drink. In the opposite direction you have the promenade which takes you to the beaches, shops, hotels and restaurants of Santiago and Los Gigantes. On the evenings I relaxed at the apartment there were numerous film and tv channels for entertainment. I had a very relaxing holiday and would definitely book another holiday to this lovely apartment. Wir haben uns im Appartement sehr wohl gefühlt. Die Terrasse ist sehr groß und hat ab frühem Mittag Sonne bis zum Abend. Der Meerblick ist grandios. Es sind nur wenige Minuten zu Fuß zum großen Strand bzw. entlang der kilometerlangen Strandpromenade. Zum kleinen Supermarkt sind es wenige Meter zu Fuß bzw. zu den größeren Märkten sind es wenige Autominuten. Die Lage insgesamt ist äußerst ruhig, man hört nichts außer dem Meeresrauschen. Der Vermieter Luc ist sehr freundlich und zuvorkommend und hilft bei allen Fragen und Problemen.